On the last blog post I talked about the first Sprouts Farmers Market coming to Naples on February 20th and how much there is to look forward to. 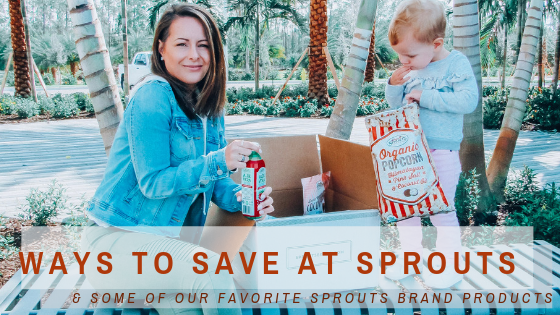 Today I will go more in detail on ways to save at Sprouts and mention some of our favorite Sprouts brand products we’ve had a chance to try! Sprouts brand offers a wide selection of natural and organic products, as well as gluten-free, vegan and non-GMO varieties. In the last couple days we had a chance to try some of the Sprouts brand products even before the store opened and we are hooked!! Our box was full of so many goodies from Himalayan Pink Sal & Coconut Oil Organic Popcorn, Almond Butter, to Facial Towelettes and so much more! I mean the Dark Chocolate Dipped Coconut Rolls are out of this world. Thats definitely a family favorite/must have now, literally fighting over the bag, sooo good! And the Aloe Vera Pomegranate Juice, delicious! No need to pick a Pomegranate apart anymore. I do want to mention the Avocado Oil because its a must try in my opinion. We all know how good avocados are for us but did you know Avocado oil has a high smoke point? This means when cooking with it, it helps not overcook your food and create trans fat. Other cooking oils do this because they push it past the smoke point. So there you go, if that isn’t reason enough on why to switch I don’t know what is! Now onto other important information like how you can save at Sprouts! Sprouts makes healthy living for less easy with a variety of ways to save throughout the store so you’ll always find more than one-third of the store on promotion at any given time! & you already know that Sprouts is famous for its farm-fresh produce, which is priced on average 20 to 25 percent below supermarket prices from my last blog post. And that’s not all, there is so many other ways to save. Sprouts has a Bulk Department, where you’ll find beans, grains, granolas, spices, nuts, sweets and much more. There you can buy as little as you need, or as much as you want, and less packaging in the Bulk Department means savings passed on to you! YAY! Another way to save is by downloading the Sprouts app and saving digital coupons to scan during checkout. Oh and every Wednesday Sprouts has their Double Ad Wednesday. The  weekly ad prices run from Wednesday to Wednesday & you can save even more in the middle of the week when the ads overlap. Two ads on one day means double the deals! 🙂 Sprouts also has other special savings sales like their Vitamin Extravaganza where you save 25% off vitamins a couple times a year & 72 Hour Sales, Frozen Frenzies, Wine Discount (save 10% when you buy any six bottles of wine) , Deal of the Month & even Sprouts Brand Sales! Now those are some ways to save, am I right?! You can also “Like” them on Facebook, follow them on Twitter, and check them out on Pinterest and Instagram for exclusive offers and sweepstakes. The first 200 shoppers in line will receive 20 percent off their initial total purchase. Doors open at 7 a.m.! Saturday, Feb. 23 – The first 200 customers to make a purchase will receive a coupon booklet for five free deli items. Sunday, Feb. 24 – Upon checkout, every 15th customer will receive a coupon for $5 off a purchase of more than $15 to use on their next visit. & if you wish you can find more information on the Naples store opening, enter for a chance to win a $500 Sprouts Gift Card, sign up for their newsletter and know of upcoming events and so much more by clicking here.